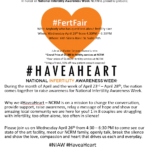 4:30-6:30pm April 25, 2018 in our office at 645 Sierra Rose Drive Suite 205 Reno, NV There will be representatives to answer questions about embryology, legal questions, genetic carrier screening questions, financial, and clinical staff available. Grand prize raffle $5K and 4 other $1K awarded. 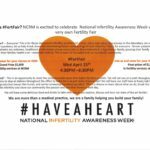 4:30-6:30pm April 26, 2017 in our office at 645 Sierra Rose Drive Suite 205 Reno, NV There will be representatives to answer questions about embryology, legal questions, genetic carrier screening questions, financial, and clinical staff available. Grand prize raffle $5K and 4 other $1K awarded. We hold a Fertility Journey Support Group every third Monday of the Month at 6PM. Come join us!